Horses & the Art of War | A Song for the Horse Nation - October 29, 2011 through January 7, 2013 - The National Museum of the American Indian - Washington, D.C. 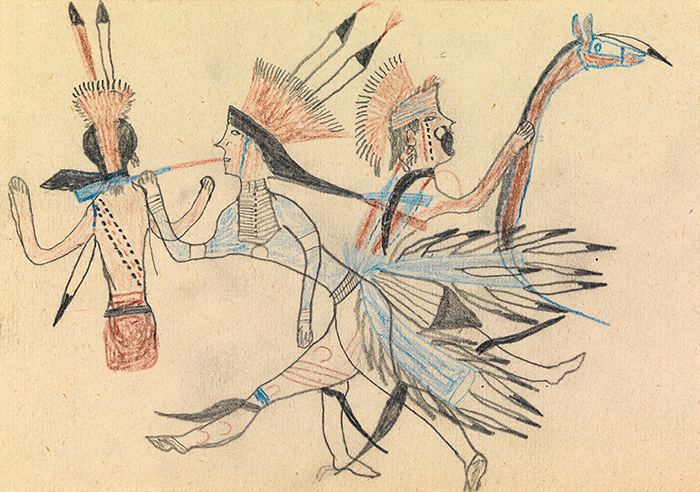 Images of conflict pervade the pictorial art of the Plains Indians. Men proclaimed their deeds in drawings on robes and tipi liners. Later, as new materials became available, vivid battle scenes sprang to life on cloth and paper. 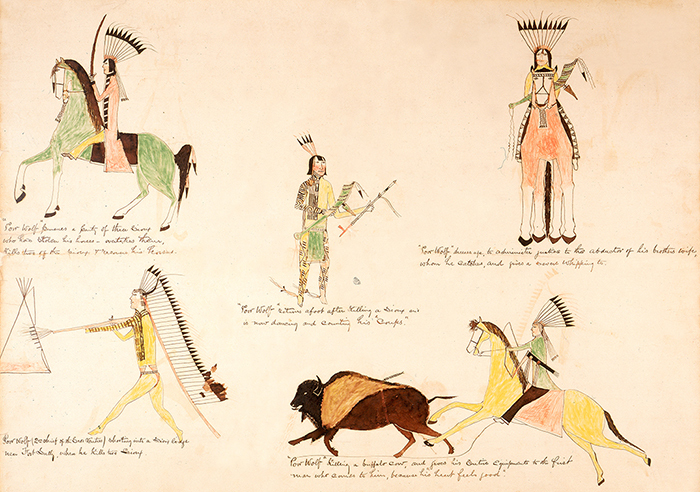 The best-known examples of Plains art are drawings made by Southern Plains fighters held prisoner at Fort Marion in Florida. 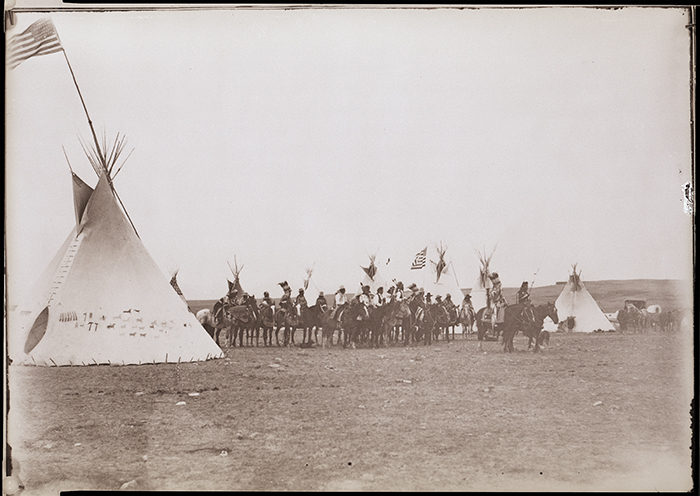 Men from the Cheyenne, Arapaho, and Kiowa tribes were arrested at the end of the Red River War in 1875 and held as hostages to ensure the peaceful behavior of their tribes. At Fort Marion, many turned their hands to recording scenes of battle and traditional life on the Plains, in army-issued ledger books. 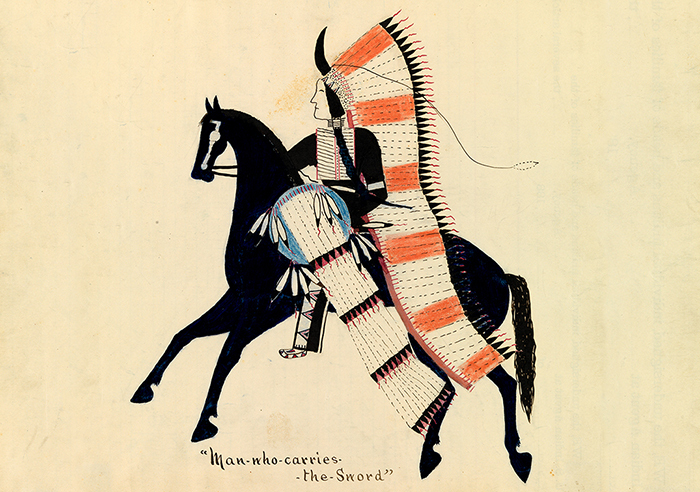 The tipi is painted with warrior society imagery: guns, hatchets, and scenes of war. 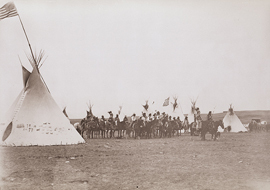 The Blackfeet continue to use traditional tipi designs such as this. 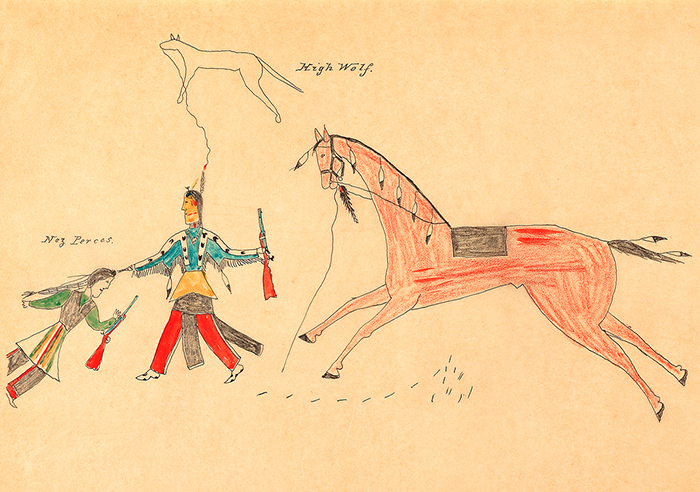 High Wolf “counts coup” against a Nez Perce, touching him with a riding quirt in a daring act of bravery. The imitation scalp under his horse’s chin indicates victories in battle for both horse and rider. Viewable online and in the gallery kiosk. 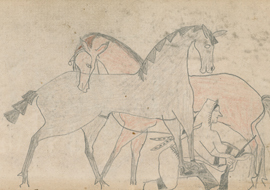 The artist is Lakota, but the subject may be from a southern Plains tribe. Man Who Carries the Sword wears an impressive bonnet with many feathers and carries a shield with feathers as well, indicating that he was a prominent warrior. The single horn on his headdress may refer to an image seen in a dream. His horse wears a silver bridle. At upper left, Poor Wolf sports a military coat and saber, possibly won in battle. The eagle feathers tied to the tail of his very elegant horse suggest that this was a highly prized animal, as does the fancy Spanish bridle. Note that the dancer carries a horse dance stick.